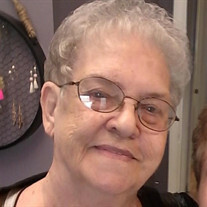 Lois L. Head, 77, Kingsport, TN, went to be with the Lord on Sunday, November 11, 2018 at Johnson City Medical Center. Lois attended Lynn View High School. She married the love of her life, Roy Head and they later moved to Long Island. She spent 10 years working at Texaco. Lois was an animal lover and enjoyed watching TV. She loved spending time with her family and friends. She was preceded in death by her infant daughter, Sarah Louise Head (1965); husband, Roy Head; parents, John Olinger and Frances Olinger; and sister, Shirley Hartsock of Idaho. Lois is survived by her daughter, Melissa (Missy) Cole; grandson, Jonathon Cole and wife, Emily; great-grandchildren, Jayden Cole and Jayson Hall; and many other family members and friends. A special thanks to the ER staff at Holston Valley Medical Center and to the ICU staff at Johnson City Medical Center. The family will receive friends from 5-8:00 pm on Wednesday, November 14, 2018 at Hamlett-Dobson Funeral Home, Kingsport. The funeral service will follow at 8:00 pm with Kathy Martin Stricker officiating. The graveside service will be held on Thursday at 3:00 pm at Oak Hill Memorial Park. Family and friends will serve as pallbearers. In lieu of flowers, memorial contributions can be made to the Sullivan County Humane Society, 2141 Idle Hour Rd., Kingsport, TN 37660.